When it comes to generating more sales, nothing might be more important than a conscious effort to re-engage with prospects who’ve already shown interest in your brand. While we have stated on several occasions that the average turnaround time for a lead-generated through AutoDeal is between 30 and 60 days (often depending on the nature of their inquiry), there continues to be an increasing volume of leads that are being generated over much longer periods of time. 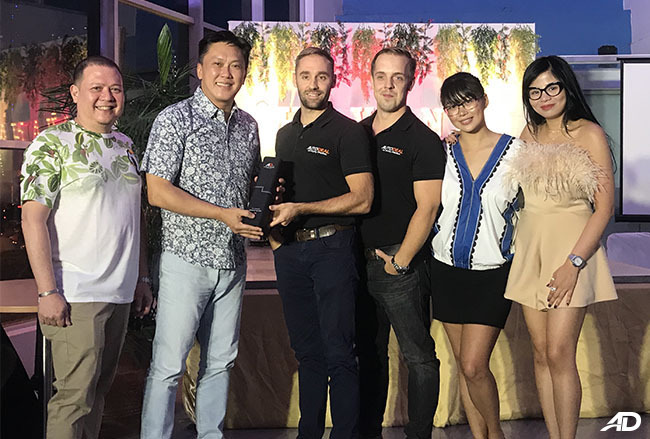 Unfortunately or fortunately (depending on how you want to look at it), this honey-pot of sales continues to be poorly exploited, mainly due to what can only be described as a shortsighted sales culture and lack of programatic re-marketing. To reiterate, we’ve found in general that customers inquiring on promotional content and specifying their buying time as being between 0-3 months, will often complete a final purchase within 30 days. Customers inquiring on non-promotional content and also stating that their buying time is between 0-3 months, will on average convert at 60 days. 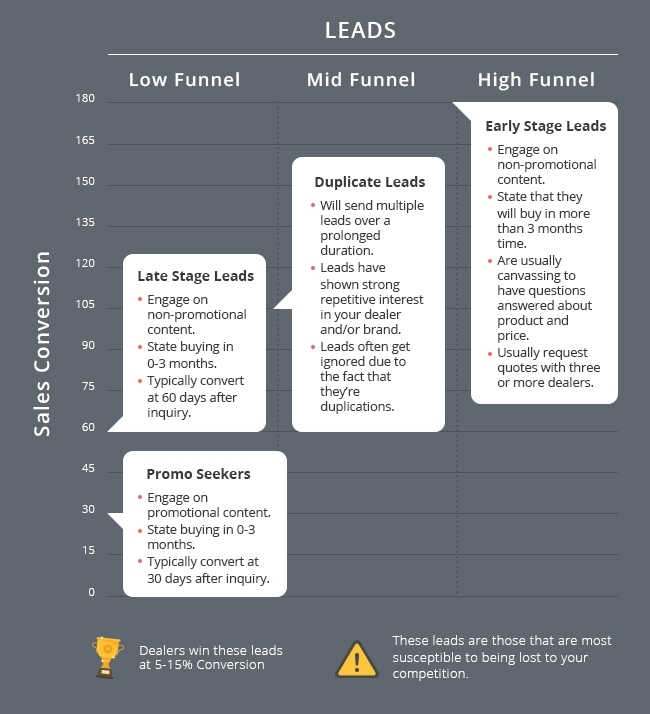 In both instances, we consider these leads to be low funnel leads, where the prospects are indicating a relatively immediate urgency to purchase. Rightfully so, these are the leads that really require a lot of energy from your sales team as they typically convert anywhere between 5 to 15%. 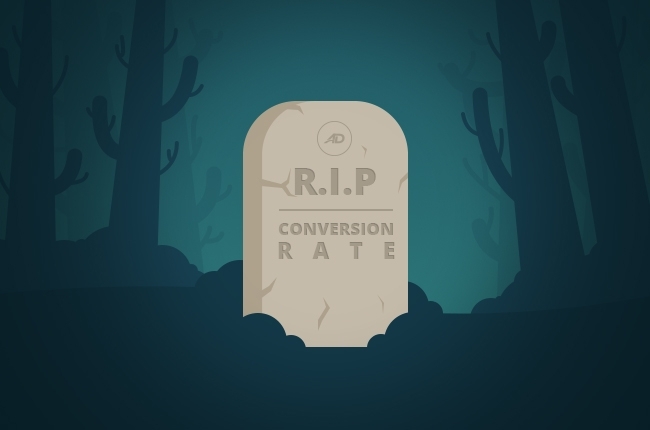 Where inefficiency is occurring is in relation to what we refer to as high funnel leads, which may take a much longer period of time to convert. To put this into context, in June 2017 we conducted a series of phone calls to 1,794 prospects who had inquired for a major automotive brand over a 6-month period between October 2016 and March 2017. The purpose of the calls were to establish if the prospects had completed a purchase, we wished to determine if they had purchase from a particular dealership group. 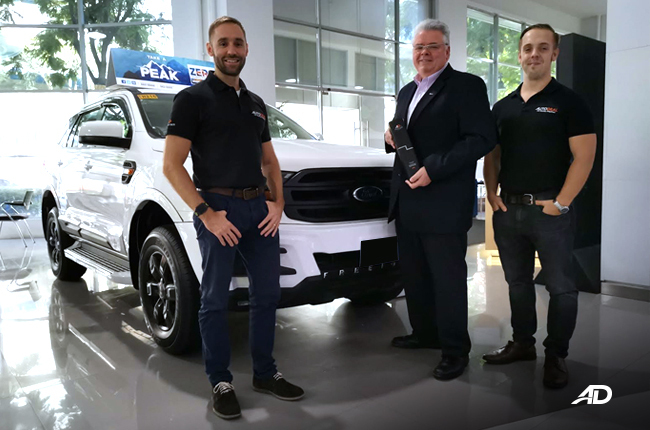 Results of the phone surveys uncovered 69 sales for the dealership group in question, accounting for around a 3.8% conversion rate on the total sample. 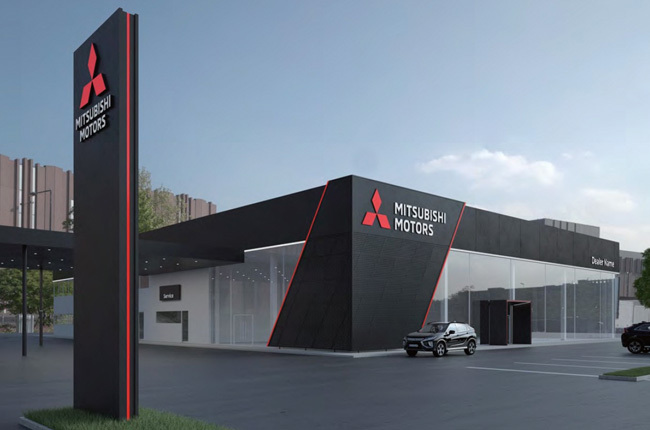 In addition to this a further 320 customers stated that they had completed a purchase from a direct dealer competitor of the same brand, which proved to be a whopping 17.8% portion of the sample size. In addition to this, a further 248 prospects purchased from a different brand entirely, accounting for a further 13.8% in lost sales. 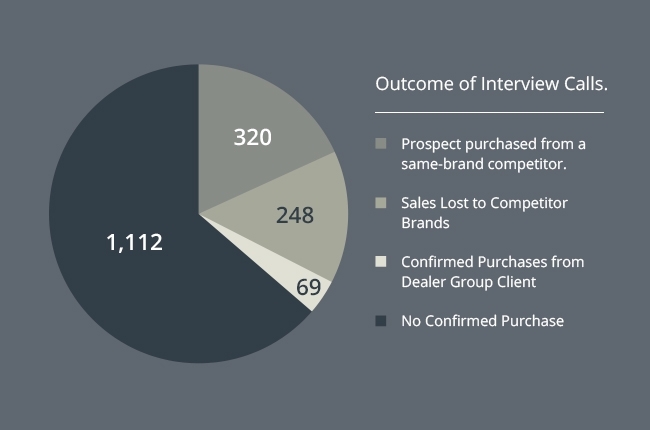 In total 35.4% of the entire sample had completed a vehicle sale. In addition to the 35.4% of customers who had completed a purchase, a further 16% claimed that they were “still interested” or “still-in-the-market” for a vehicle, even if for some of them, their initial inquiry had been up to 9 months ago. 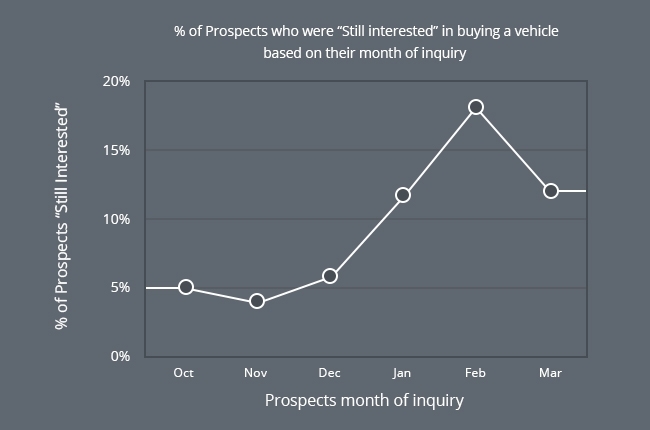 As shown in the graph above, the more recent the inquiry, the more likely the prospect was to be still interested in making a purchase. So what does this all mean? In short, opportunities are being missed; and the only way to solve it is through increased cooperation between your sales and marketing teams to nurture all levels of your lead funnel. So where to start? First dig into your database and find all the leads that never received any feedback from your sales team. It’s never too late to begin contacting them and you’ve got nothing to lose by doing so. After you’ve done this consider further categorizing your database into prospects based on the dates in which they inquired with you or by the types of products they showed interest in. You can then begin thinking about your messaging to re-engage these prospects. For instance, for those that inquired more than three months ago, a simple communication asking if they’re still in the market for a new vehicle could be a simple enough solution to make some prospects bight. For those more recent, a redistribution of your latest inventory or special offers could be enough to entice them into making contact again with their agent. The tools required for nurturing these leads are many, ranging from e-mail marketing applications to more sophisticated (and expensive) automated CRM technology. 1. One shoe does not fit all. When you’re set at the task of nurturing your leads, remember that you may want to incorporate different messages to various different audience groups. It’s likely that many of your prospects have inquired for different products, so categorizing them into simple groups based on these preferences might be a good first step. Launching a new promotion or conducting a flash-sale? Remember to incorporate your re-marketing into much of your wider marketing plans so that you can give your prospects ample time to consider their purchase options. 3. Understand what you’re trying to achieve. What’s the purpose of your re-marketing communications? Are you using a call-to-action? If so, what portion of your users are engaging. You can only measure the effectiveness of your campaigns when you understand the metrics you are measuring. 4. Evaluate the outcome and repeat. Re-marketing is a skill set of its own, understanding how time and titles effect your open rate and click rate will help you grow to be more successful over time. You can develop these skills in-house or use a professional services company or software to help make things simpler for you.